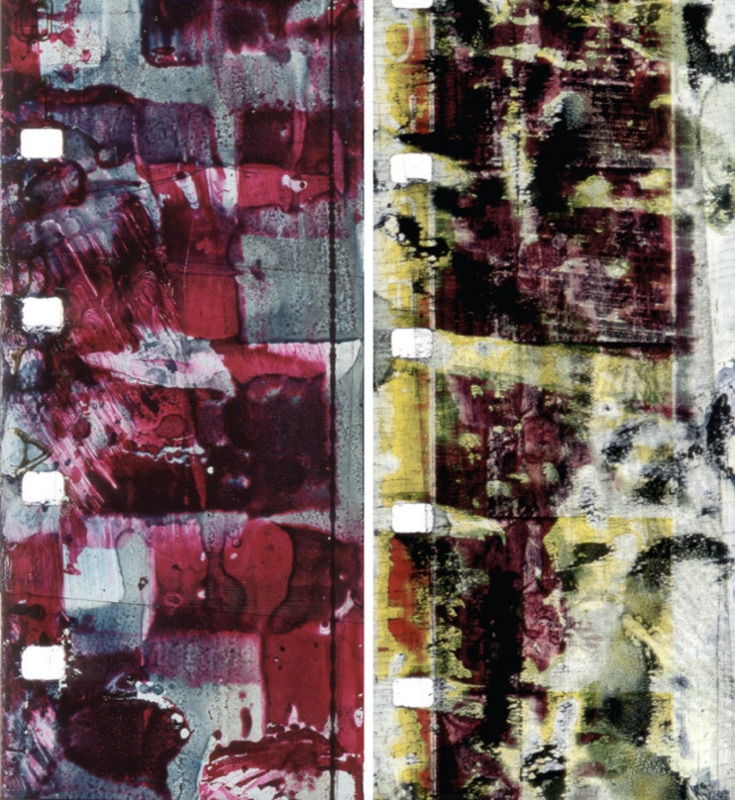 Luther Price, Fragile X—Inkblot #13, 2008, and Inkblot #31, 2009, strips from two handpainted films in 16 mm, 7 minutes and 8 minutes, respectively. 1 Inkblot films (Luther Price) Produced by scraping the emulsion from old footage, recutting it, and coloring it with inks and Sharpies, Price’s 16-mm and Super 8 inkblot filmsa selection of which he screened in person in Milwaukee and Chicago this yearhave nothing of the stained-glass delicacy characteristic of handpainted work; rather, they struggle through the projector with an unsettlingly existential corporeality. 2 Two Years at Sea (Ben Rivers) In this feature-length visit with a woodlands hermit in Scotland, Rivers disjoints documentary images from any clear place and time, creating something both postapocalyptic and prelapsarian. 3 Words of Mercury (Jerome Hiler) A set of intricate variations on super­imposition rich with Kodachrome hues, Hiler’s filmhis first new work screened publicly in more than a decadewas the most quietly exhilarating premiere at this year’s New York Film Festival. 4 High-Definition Video Guide (Electronic Arts Intermix) Written by Leah Churner, this no-nonsense technical primer should be required reading for anyone in the art world who plans to exhibit video. From now on, there’s no excuse for getting your aspect ratios wrong. 5 The Turin Horse (Béla Tarr) Tarr claims (once again) that this will be his final film, and it feels appropriately end-time, depicting with magnificent austerity the daily life of a farmer and his daughter as the world collapses. 6 Quality Control (Kevin Jerome Everson) Typically gnomic, Everson’s latest featurewhich premiered on the heels of his survey at the Whitney Museum of American Art in New Yorkis also his sharpest, a portrait of an Alabama dry cleaner taken from every angle of operation. 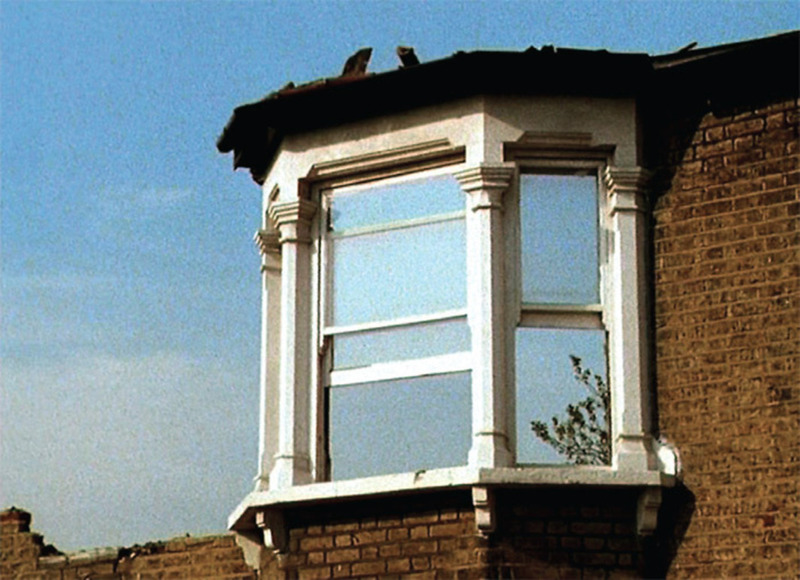 John Smith, Blight, 1994–96, still from a color film in 16 mm, 14 minutes. 7 John Smith (Lux DVD box set) Four decades of work from one of Britain’s shrewdest filmmakers, who reshapes narrative and documentary forms into philosophical puzzles. 8 You Are Not I (Sara Driver) A strange and compelling artifact, depicting its post-traumatic protagonist in a No Wave Twilight Zone, Driver’s 1981 featurette resurfaced unexpectedly when the only extant undamaged print was discovered in Tangier, among the late Paul Bowles’s possessions. 9 Once Upon A Time in Anatolia (Nuri Bilge Ceylan) A grim and epic policier, Ceylan’s Turkish talkie is also, in more ways than one, a study of bodies in the landscape. 10 Ericka Beckman, Manuel DeLanda, and Bette Gordon (Anthology Film Archives, New York) This spring, Anthology unveiled long-awaited preservations of early films from these underseen artists who, in the 1970s and ’80s, sought to reassemble cinematic structures with algebraic precision. Ed Halter is a founder and director of Light Industry, New York, and a cocurator of the film and video program for the 2012 Whitney Biennial.